This is not the first book I have read by Gianrico Carofiglio. Some years ago I picked up another of his novels, intrigued by the promise of a story deeply informed by the writer’s experiences. Why? 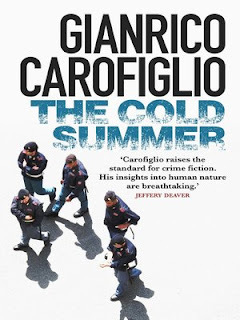 Because Gianrico Carofiglio is no ordinary crime writer. He is a man who spent most of his working life as a prosecutor specializing in organised crime. In 2007 he was appointed as advisor to the Italian government’s anti-Mafia committee, and the following year he became a Senator. So not a run-of-the-mill writer, then. And when you read his books, you can feel the depth of his knowledge, but also the deep humanity of the writer. This story takes the reader back to the 1990s when there was a spate of chilling attacks on the justice system in Italy. Giovanni Falcone, his wife and several police officers were murdered by a massive bomb; a couple of months later, Paolo Borsellino and five more police were killed when a car bomb was set off as they passed. Falcone and Borsellino were enthusiastic anti-Mafia prosecutors, and posed a significant threat to the Sicilian families. The public outcry at these two atrocities was immediate - and the crackdown in their aftermath effective. Those responsible were identified, arrested, prosecuted, and convicted. However, the Mafia violence was not unique to Sicily. There were gang wars between other Mafia gangs up and down Italy. This book takes the reader to Apulia, where the fighting was as brutal as anywhere. I began reading this book immediately after reading a very different story indeed, and I read the first page with a real sense of gratitude. Whereas the previous book had been more of a character study set in a vaguely criminal environment, there were many aspect that I could simply not come to terms with. Within three pages of THE COLD SUMMER I felt I had been wrapped in a comfort blanket. This was a crime book written by a man who knew his subject and how to plot a story. I knew who the main character was, I was fully convinced by the way he was depicted, and I was very content with his behaviour. It’s an excellent beginning to a crime story - I recommend it. To summarise: Pietro Fenoglio is a local officer in the Carabinieri. He has recently been left by his wife, and is trying to come to terms with his new status as a single man, while hoping she will return to him. But there is a brutal turf war being fought in the area around Bari, and he is soon thrown into the midst of the fighting as a Mafia boss’s son is kidnapped. The thought of an ordinary criminal risking his life by kidnapping a Mafiosi’s son is hard to accept. This must be a symptom of the gang war. Surely only a suicidal gangster would try to take on one of the most senior Mafiosi in the area? Rumours abound, and Fenoglio begins to have an idea who is responsible. But then the man suspected of the kidnapping surrenders himself. The boy is found dead, but the suspect denies killing him. The police are forced into an investigation in which those investigating are forced to look at their own attitudes and behaviours. In a morally confusing world, the police have to look at their own motives, their own actions. The story is split into three “Acts”. The first is the setup of the story, the kidnap, the search for the killer; second comes a part in which we are brought into the interrogation of the suspect, with the interview transcripts interspersed with the continuing story; finally the story returns to a straightforward linear path, hurtling towards the resolution. This is not like a Michael Connelly, or Harlan Coben. There are not the sudden imaginative twists and turns that you expect from an American master; however, this story is convincing at a much deeper level. It feels less like a story constructed by an author, and more like an autobiographical narration, a man speaking of his memories of a time in the recent past, speaking about his own experiences of such investigations, and who has had to confront his own demons in the battle against organised crime. Carofiglio doesn’t resort to devious plot twists to establish his characters and storyline - he doesn’t need to. His knowledge of his subject is deep enough to imbue his writing with conviction.